Eight Jefferson County WV residents ventured to the Steel City October 20 to spread the news of what Rockwool N.A. is doing in their home county. Pittsburg was the setting for the North American Passive Home Network Conference and Expo. The folks from Jefferson County were there to talk about their home, but were far from passive. Armed with signs, handouts, and firm determination they entered the conference center around 8am to spread their message, but for three of them the stay was brief. Three people removed their anti-Rockwool clothing and went into the exhibit hall. 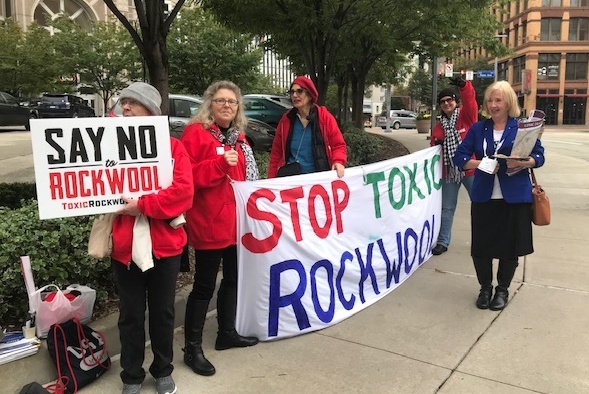 They couldn’t speak with representatives of manufacturers, architects and the like about the stress and turmoil Rockwool was causing in the eastern West Virginia county, but they did manage to leave some ToxicRockwool fact sheets on Rockwool’s display next to examples of their products. I attended the Rockwool sponsored session entitled"Certified Passive House Details for Commercial Buildings" presented by Todd Kimmel, CPHD (Certified Passive House Designer), CDT, and the Northeast Architectural Manager for Rockwool Insulation, and Alejandra Nieto, Building Science Project Manager at ROCKWOOL North America and a Certified Passive House Consultant. In this session, they touted the advantages of building with Rockwool components to reduce operational energy requirements. They also received their official "Passive House Institute Certification for the Rockwool Passive House Certified Mass Wall Unit (CMU)". Ms. Nieto mentioned that it was long, difficult process to obtain the certification. It was meant to be a celebratory moment, but I dampened the atmosphere when I asked questions concerning the "embodied energy and carbon cost" of their product as I had heard that the manufacturing process was fossil fuel intensive and highly polluting. Mr. Kimmel and Ms. Nieto sidestepped answering my question by referring me to their sustainability expert who could provide me with the LCA's (life cycle assessment) for the materials. I also inquired about the formaldehyde and other indoor pollutants in these airtight houses since they use a formaldehyde binder in the product. They responded that the components that include formaldehyde are only used on exterior walls for this reason. At the conclusion of the session and Q&A, I donned my "Say No to Rockwool" sweatshirt and distributed toxic Rockwool fliers to both the speakers and audience. My purpose in doing so was to educate both the proponents of Passive House design AND the Rockwool speakers--I highly doubt that they are aware of the unethical plans for the Ranson factory and I want to create internal pressure in Rockwool against the facility. While handing out the materials, I was approached by a woman who requested the materials, but began disputing the points--even the air permit numbers-she claimed that numbers could be misleading.